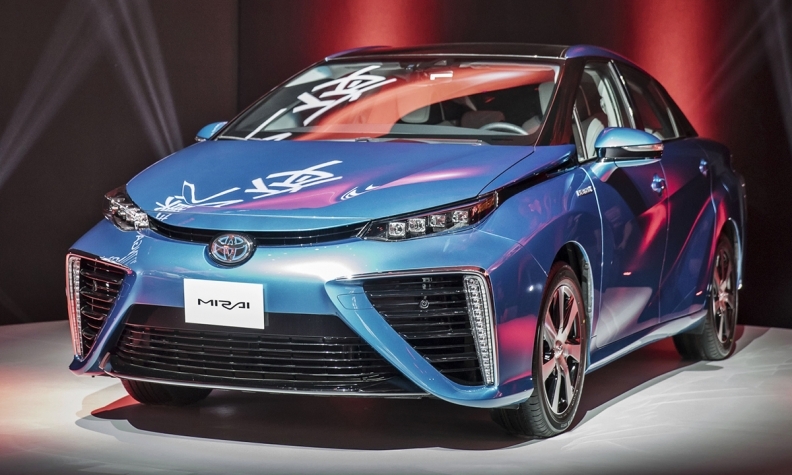 MONTREAL — Toyota is introducing its first hydrogen fuel cell vehicle into Canada's most active electric vehicle market later this year, a move that could eventually help eliminate emissions from automobile use in Canada. About 50 Mirai fuel cell electric vehicles are expected to be delivered to Quebec in 2018 for use by government and private fleets. Quebec Energy Minister Pierre Moreau said the province is an ideal location for these cars because of cheap, clean hydroelectricity that can be used to produce liquid hydrogen. "It's a very important announcement because Quebec will become the window in all Canada for the hydrogen car," he said, after the Japanese carmaker unveiled its plans at the Montreal International Auto Show. Quebec has pushed the adoption of electric vehicles, in part by passing Canada's first law mandating a minimum threshold of EV sales. But Moreau said the government is open to other technologies as it aims to reduce its use of fossil fuels by 40 per cent in 2030. "I see a synergy and not a competition," he said. While most electric vehicle cars have limited range which makes them most suitable for urban travel, the Mirai can travel 500 kilometres on a single tank that is quickly filled and can operate in the coldest conditions. By contrast, most EV recharging is done at home overnight, and even the fastest charges take 30 minutes or more. The province will open two hydrogen fuel stations next fall — one in Montreal and one Quebec City — that will produce and distribute hydrogen fuel. The cars to be delivered towards the end of the year will be tested during a pilot phase. The government hasn't yet determined if Hydro-Quebec or the private sector would eventually produce hydrogen for sale within the province and beyond. Toyota Canada isn't ready to announce when the vehicles will be available for public purchase or the selling price. In California, they sell for US$57,000 minus rebates and include a three-year supply of hydrogen. Toyota Canada vice-president Stephen Beatty said he expects sales will quickly accelerate as refuelling infrastructure develops. B.C. and Ontario are also building fuel stations. "I suspect that this, like all advanced technology projects, is going to take its time but there's enormous promise for it because it's not just about cars," he said in an interview. Beatty said every major car manufacturer is looking at hydrogen fuel. He said different consumer options are needed to achieve the ultimate goal, which is to drive carbon out of transportation. Electric vehicles remained a topic of interest at the auto show with the display of about 40 models just days after Quebec's zero emissions laws formally came into effect. Car companies like BMW, Ford and Volkswagen are preparing to introduce a series of new electric vehicle options over the coming years. Electric vehicles grew strongly last year but still accounted for only about one per cent of all sales in Canada. Magna International says the internal combustion engine will remain dominant for years to come even as electric vehicle sales grow. By 2025, it expects global electric vehicle sales will account for just six per cent of sales, rising to 13 per cent in 2030.